Enter your name as you wish to have it displayed. Enter your <account name>@datatruck.com address at the appropriate prompt. 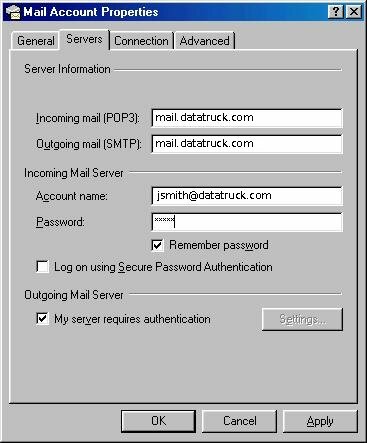 Enter mail.datatruck.com for both the incoming (POP3) and outgoing (SMTP) servers. Enter <account name>@datatruck.com as your account name and your assigned password at the appropriate prompts. 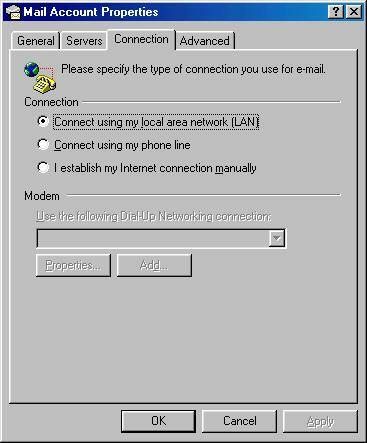 Close Outlook Express and restart it to make the new settings take effect. Send yourself a test message to verify that the settings are correct. Use the Send/Recv button to expedite the sending and receiving of your test message. You may wish to review your list of accounts and delete any of those known to be invalid or inactive. 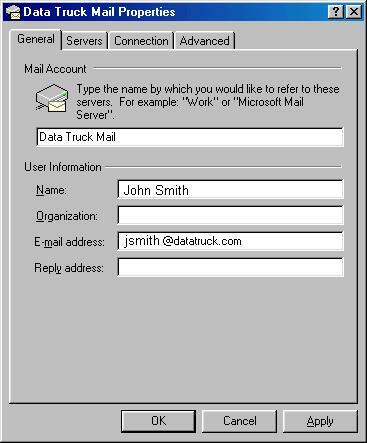 Click the "Servers" tab at the top, then enter mail.datatruck.com as the incoming (POP3) and outgoing (SMTP) servers. Enter your e-mail address as the Account Name. Enter your password as shown (asterisks will appear in place of your typed characters). Put a checkmark next to My server requires authentication. Click OK, then Apply, then OK again. Close and restart Outlook to make the new settings take effect. Send yourself a test message to verify that the settings are correct. Use the Send/Recv button to expedite the sending and receiving of your test message. These instructions were created using Apple Mail Version 3.6 (936). Your version may differ therefore the setup process may vary slightly. • Open Apple's Mail program. If you've never used it before, you should be presented with a questionnaire to help you set it up. Enter your full name, e-mail address and password, and click the Continue button. 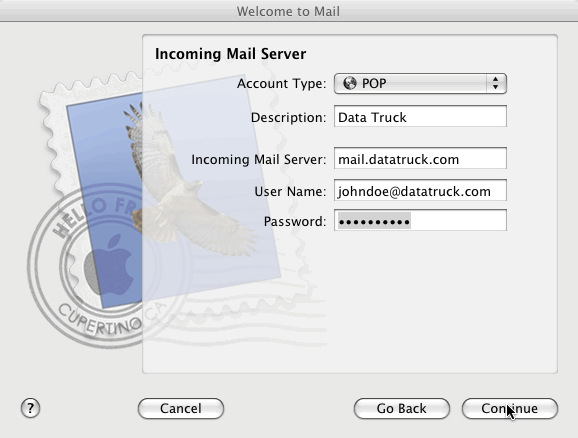 • On the Incoming Mail Server screen, choose Account type of POP and enter Description of Data Truck. 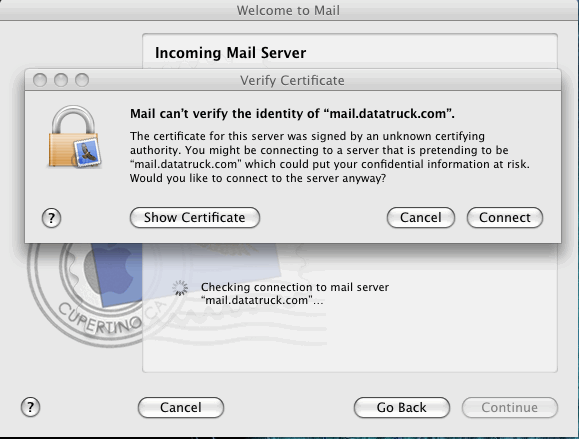 For Incoming Mail Server, enter mail.datatruck.com. 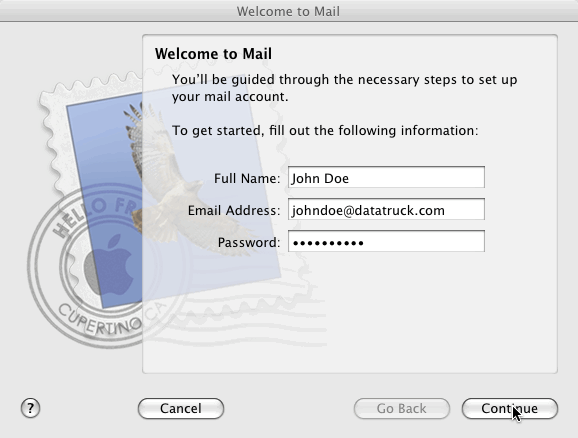 User Name is the same as your e-mail address (make sure this includes @datatruck.com), and enter your password. Click the Continue button. 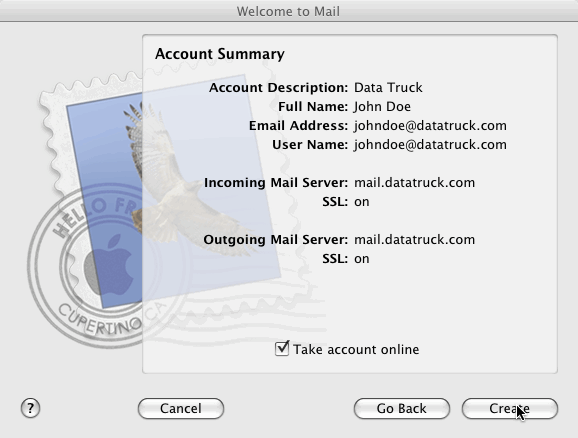 • On the Outgoing Mail Server screen, enter Description of "Data Truck" and Outgoing Mail Server "mail.datatruck.com". Check the boxes for "Use only this server" and "Use Authentication". Your username and password should be automatically filled in. Click Continue. NOTE: Sometimes the process of testing the connection will hang for a long time and appear to be stuck. If your computer does this for more than a minute, it is safe to click Cancel, then click Continue again. • If all went well, you should now be presented with an Account Summary screen. Confirm the check mark next to Take Account Online then click the Connect button. NOTE: Your summary screen may show SSL as On or Off; it will work either way. That's it. 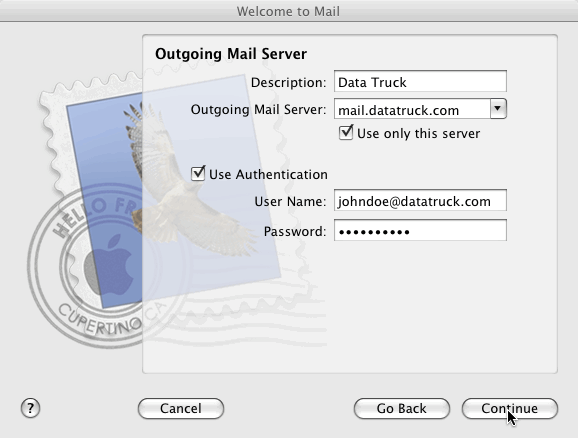 You should now be able to use your Mail program with Data Truck's e-mail service.